Publisher: Princeton University Press, 1963. 7th printing. Condition: Hardcover, no dust jacket. Very good. 577pp. App 9″ by 6″. A heavy book. Overseas shipping will cost extra. 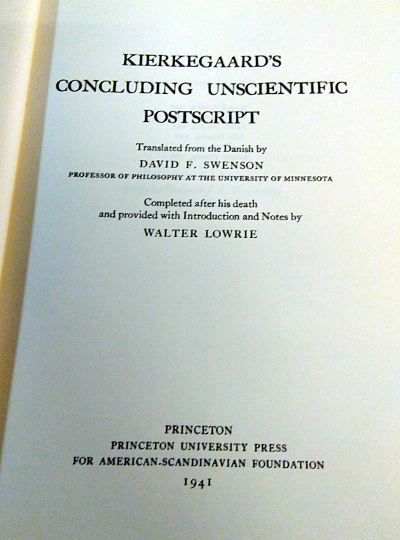 Concluding Unscientific Postscript to the Philosophical Fragments is a major work thought to be by Søren Kierkegaard. The work is a poignant attack against Hegelianism, the philosophy of Hegel, especially Hegel’s Science of Logic. The work is also famous for its dictum, Subjectivity is Truth. It was an attack on what Kierkegaard saw as Hegel’s deterministic philosophy. Against Hegel’s system, Kierkegaard is often interpreted as taking the side of metaphysical libertarianism or freewill, though it has been argued that an incompatibilist conception of free will is not essential to Kierkegaard’s formulation of existentialism. As the title suggests, the Postscript is sequel to the earlier Philosophical Fragments. The title of the work is ironic because the Postscript is almost five times larger than the Fragments. The Postscript credits “Johannes Climacus” as the author and Kierkegaard as its editor. Like his other pseudonymous works, the Postscript is not a reflection of Kierkegaard’s own beliefs. 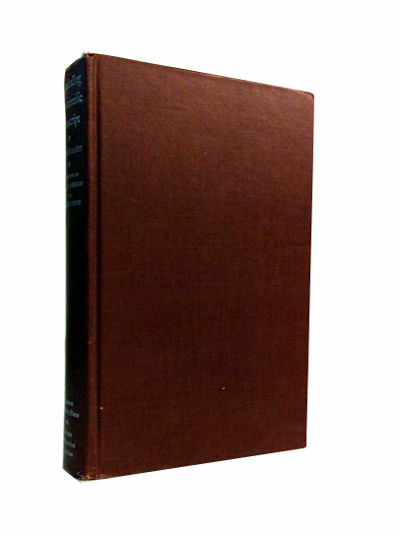 However, unlike his other pseudonymous works, Kierkegaard attaches his name as editor to this work, showing the importance of the Postscript to Kierkegaard’s overall authorship. Søren Aabye Kierkegaard (5 May 1813 – 11 November 1855) was a Danish philosopher, theologian, poet, social critic and religious author who is widely considered to be the first existentialist philosopher. He wrote critical texts on organized religion, Christendom, morality, ethics, psychology, and the philosophy of religion, displaying a fondness for metaphor, irony and parables. Much of his philosophical work deals with the issues of how one lives as a “single individual”, giving priority to concrete human reality over abstract thinking and highlighting the importance of personal choice and commitment. He was against literary critics who defined idealist intellectuals and philosophers of his time, and thought that Swedenborg, Hegel, Goethe, Fichte, Schelling, Schlegel and Hans Christian Andersen were all “understood” far too quickly by “scholars”.